Home / Opinion / Pa-relevant si Madam! Lawyer slams Poe after her calamity fund remarks: Don't tell me you suddenly cared? Pa-relevant si Madam! Lawyer slams Poe after her calamity fund remarks: Don't tell me you suddenly cared? Lawyer, a staunch supporter of Pres. Rodrigo Duterte, prominent social media personality, and BolJak host Atty. Bruce Rivera took the liberty to respond on what Sen. Grace Poe tweeted, Wednesday. This, after the latter as though released a statement aimed at the government. 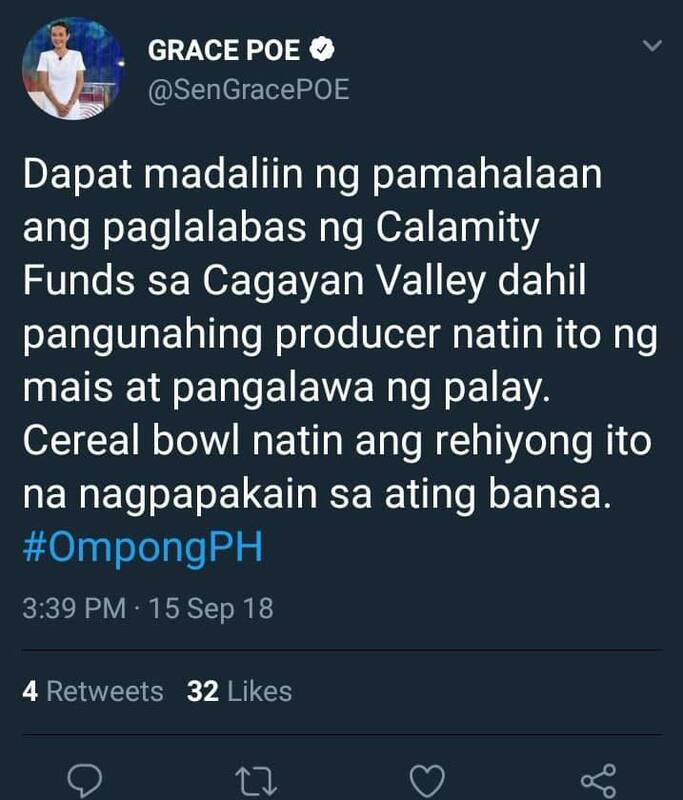 On her tweet, she said, "Dapat madaliin ng pamahalaan ang paglalabas ng Calamity Funds sa Cagayan Valley". In addition, the FPJ's kin stated that the said rural area is the country's number one producer when it comes to corn production and the second in rice. "pangunahing producer natin ito ng mais at pangalawa ng palay", Sen. Poe said, calling Cagayan Valley a 'cereal bowl' that feeds the country. 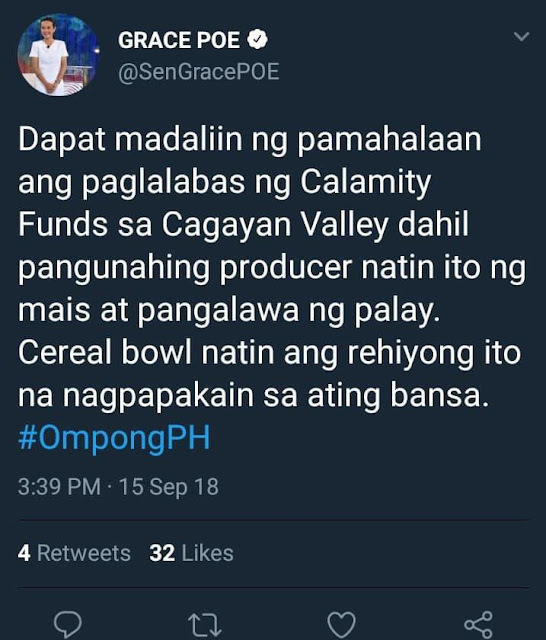 The Senator ended the tweet with the hashtag #OmpongPH. While this seems impressive for some, there are people who know how to look beneath the surface. One of them is the Atty. Bruce Rivera. In his Facebook post, he told the Senator that she is one of the people she addressed as "the government". "Madame, Kasama ka sa pamahalaan", the pro-Duterte lawyer started. Later, Atty. Rivera asked Poe whether or not she tweeted the same for the previous administration after the tragic typhoon Yolanda hit the country. "Nung aftermath ba ng Yolanda, naglabas ka ng tweet na madaliin ang pagpadala ang kabaong, body bag, tubig at iba pang relief goods sa Tacloban. Hindi di ba? Quiet ka", he wrote. Further taking a trip down memory lane, the fierce lawyer recalled how it was like during PNoy's time. "Habang ang mga tao sa Tacloban halos mamatay na sa gutom at naagnas ang mga bangkay ng mga mahal nila sa buhay. Minadali mo ba si PNoy? ", the BolJak host continued. On the other hand, Atty. Rivera told the Senator that the there are not much casualty due to the current government's urgent efforts to address the needs of those affected by the typhoon, but the way Poe said it, according to Rivera, it was as if she was trying to tell the concerned authorities to act faster (when they already are). "Ngayon, andun na lahat ng executive kasama ang Pangulo, walang malaking death toll, hindi naman namamatay sa gutom ang mga taga-Norte dahil natutugunan ng gobyerno ang lahat ng dapat itugon pero kung umasta ka, parang kailangan mas bilisan pa", the enraged lawyer said. Nonetheless, the staunch supporter of the firebrand Mindanaoan President mentioned that he totally understood her point. However, it is the Senator's consistency that he was driving at that may have something to do with her bias. "I get your point. Pero consistency di ba? Kung di mo kayang pabilisin ang kilos ng gobyerno nung panahon ni Yolanda dahil kakampi mo sila, anong karapatan mo magmando na bilisan ngayon. ", the lawyer said. Rivera concluded his post intended for Poe saying: "Do not tell me you suddenly cared?" Kasama ka sa pamahalaan. Nung aftermath ba ng Yolanda, naglabas ka ng tweet na madaliin ang pagpadala ang kabaong, body bag, tubig at iba pang relief goods sa Tacloban. Hindi di ba? Quiet ka. Habang ang mga tao sa Tacloban halos mamatay na sa gutom at naagnas ang mga bangkay ng mga mahal nila sa buhay. Minadali mo ba si PNoy? Ngayon, andun na lahat ng executive kasama ang Pangulo, walang malaking death toll, hindi naman namamatay sa gutom ang mga taga-Norte dahil natutugunan ng gobyerno ang lahat ng dapat itugon pero kung umasta ka, parang kailangan mas bilisan pa. I get your point. Pero consistency di ba? Kung di mo kayang pabilisin ang kilos ng gobyerno nung panahon ni Yolanda dahil kakampi mo sila, anong karapatan mo magmando na bilisan ngayon. Do not tell me you suddenly cared?